SEATTLE, Washington, January 15, 2014 (ENS) – Proposed large-scale mining in Alaska’s Bristol Bay watershed would pose risks to the world’s largest sockeye salmon fishery and Alaska Native cultures dependent on salmon, the U.S. Environmental Protection Agency concludes in its final Bristol Bay Assessment released today. The report, titled “An Assessment of Potential Mining Impacts on Salmon Ecosystems of Bristol Bay, Alaska,” is a scientific report, not a decision document, Dennis McLerran, regional administrator for EPA Region 10, told reporters on a conference call. “The assessment is a technical resource for governments, tribes and the public as we consider how to address the challenges of large-scale mining and ecological protection in the Bristol Bay watershed,” said McLerran. “Over three years, EPA compiled the best, most current science on the Bristol Bay watershed to understand how large-scale mining could impact salmon and water in this unique area of unparalleled natural resources,” McLerran said. Northern Dynasty Minerals Ltd., a mineral exploration and development company based in Vancouver, Canada, owns 100 percent of the Pebble Partnership. The company aims to develop a globally significant copper, gold and molybdenum deposit in the Bristol Bay watershed known as the Pebble Mine. The site of the proposed Pebble Mine is located 200 miles southwest of Anchorage on state land designated for mineral exploration and development. It is situated in a region of rolling tundra 1,000 feet above sea level, 65 miles from Cook Inlet, which receives the water that rushes down the rivers of the Bristol Bay watershed. 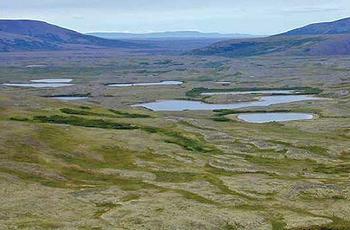 The Bristol Bay watershed is an undisturbed region with outstanding natural, cultural, and mineral resources. Within the larger watershed, the EPA assessment focuses on the Nushagak and Kvichak River watersheds, the largest of the Bristol Bay watershed’s six major river basins, containing about half of the total watershed area. They areidentified as mineral development areas by the State of Alaska. The Pebble copper and gold deposit is the most likely site for near term, large-scale mine development in the region. Because the Pebble deposit is located in the headwaters of tributaries to both the Nushagak and Kvichak Rivers, both of these watersheds are subject to potential risks from mining, the EPA concludes. 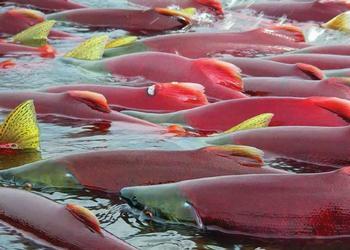 The Bristol Bay watershed supports all five species of Pacific salmon found in North America: sockeye, coho, Chinook, chum and pink. The most important is the sockeye salmon fishery, which produces nearly half of the world’s wild sockeye salmon with runs averaging 37.5 million fish each year. In addition, the watershed is inhabited by more than 20 other fish species, 190 bird species, and more than 40 species of terrestrial mammals, including bears, moose and caribou. To assess potential mining impacts to salmon resources, EPA considered realistic mine scenarios based on a preliminary plan that was published by Northern Dynasty and submitted to the U.S. Securities and Exchange Commission. EPA also considered mining industry references and consulted mining experts. Numerous risks associated with large-scale mining are detailed in the assessment. Mine Footprint: Depending on the size of the mine, EPA estimates 24 to 94 miles of salmon-supporting streams and 1,300 to 5,350 acres of wetlands, ponds, and lakes would be destroyed. EPA estimates an additional 9 to 33 miles of salmon-supporting streams would experience altered streamflows likely to affect ecosystem structure and function. Waste and Wastewater Management: Extensive quantities of mine waste, leachates, and wastewater would have to be collected, stored, treated and managed during mining and long after mining concludes. Consistent with the recent record of similar mines operating in the United States, polluted water from the mine site could enter streams through uncollected leachate or runoff, in spite of modern mining practices. Under routine operations, EPA estimates adverse direct and indirect effects on fish in 13 to 51 miles of streams. Wastewater Treatment Plant: Short and long-term water collection and treatment failures are possible. Depending on the size of the mine, EPA estimates adverse direct and indirect effects on fish in 48 to 62 miles of streams under a wastewater treatment failure scenario. Transportation Corridor: A transportation corridor to Cook Inlet would cross wetlands and approximately 64 streams and rivers in the Kvichak River watershed, 55 of which are known or likely to support salmon. Culvert failures, runoff, and spills of chemicals would put salmon spawning areas in and near Iliamna Lake at risk. Pipeline: Consistent with the recent record of petroleum pipelines and of similar mines operating in North and South America, pipeline failures along the transportation corridor could release toxic copper concentrate or diesel fuel into salmon-supporting streams or wetlands. Tailings Dam: Failure of a tailings storage facility dam that released only a partial volume of the stored tailings would result in catastrophic effects on fishery resources. The assessment found that the Bristol Bay ecosystem generated $480 million in economic activity in 2009 and provided employment for over 14,000 full and part-time workers. Other tribes asked EPA to wait for a mine permitting process to begin before taking action on the potential environmental issues Pebble Mine presents. Before responding to these requests, EPA identified a need for a scientific assessment to better inform the agency and others. EPA and other scientists with expertise in Alaska fisheries, mining, geochemistry, anthropology, risk assessment, and other disciplines reviewed information compiled by federal resource agencies, tribes, the mining industry, the State of Alaska, and scientific institutions from around the world. EPA maintained an open public process, reviewing and considering all comments and scientific data submitted during two separate public comment periods. The agency received some 233,000 comments on the first draft of the assessment and 890,000 comments on the second draft. EPA held eight public meetings attended by about 2,000 people. EPA consulted with federally recognized tribal governments and Alaska Native Claims Settlement Act village and regional corporations. The study was independently peer reviewed for its scientific quality by 12 scientists with expertise in mine engineering, salmon fisheries biology, aquatic ecology, aquatic toxicology, hydrology, wildlife ecology, and Alaska Native cultures. Nevertheless, Northern Dynasty was critical of the EPA assessment. Thiessen said the final BBWA report does not include any recommendations or regulatory actions that will affect future development of the Pebble Project. “We look forward to defining a proposed development plan for Pebble and to having it reviewed by federal and state regulatory agencies under the National Environmental Policy Act (NEPA) in the months and years ahead,” Thiessen said. “We have every expectation that the Environmental Impact Statement (EIS) process required by NEPA, to be administered by the U.S. Army Corps of Engineers, will ultimately provide a much more rigorous, fair and transparent review of the science surrounding this important project,” the Northern Dynasty executive said. But the commercial fishermen of Bristol Bay praised the EPA assessment. Environmental groups were pleased with the assessment, in part, because it covers not only risks from the Pebble Mine but also from the development of other mines in the same region. In addition to the Pebble Mine prospect, EPA’s final Bristol Bay Assessment identifies 15 other mine prospects in the region, some that might impact nearby Lake Clark National Park and Preserve. “If Pebble is developed, many more mines could follow. With an expanded network of mines, mills, roads, tailings storage facilities, and other infrastructure, EPA says the cumulative effects of a mining district could be ‘widespread and extensive,’ said Melissa Blair, Alaska program manager with the nonprofit National Parks Conservation Association. Lake Clark National Park and Preserve was created by Congress in 1980. 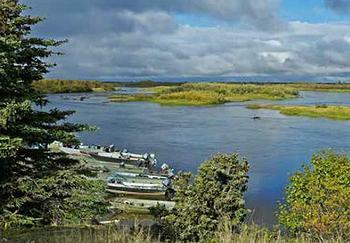 One of the core mandates of the park is to protect Bristol Bay’s salmon habitat.